More than 100 people were evacuated from a Flybe flight at Exeter Airport today after the engine made a loud banging noise and the cabin filled up with smoke. Passengers had boarded the Flybe Embraer plane to the Spanish resort of Alicante and the pilot was preparing to leave when the air in the cabin became hazy. Two airport fire engines rushed to the plane to investigate the technical problem with the air-conditioning as 100 passengers and five crew members were evacuated. All those onboard BE4321 were returned to the terminal by airport coaches at about 8am. The runway was closed for one hour during the emergency but later reopened. Danny Keating, from Looe, Cornwall, was among the passengers on the plane and going on his stag do to Benidorm when the call came over the Tannoy to evacuate. He told Heart Radio: ‘We’re all on the plane about to take off and the engine makes a loud banging noise and the cabin fills up with smoke. ‘The pilots are shouting over the Tannoy ‘evacuate, evacuate’, which is always good to hear. With that, all the doors get ripped off and the slides open up. ‘People were going down the slides, people flying everywhere. Then me and my brother got either side of the slide and started to help people off down the bottom. ‘Something that you can tick off the bucket list, but usually it happens right at the end of your bucket list. It was interesting going down the slides. 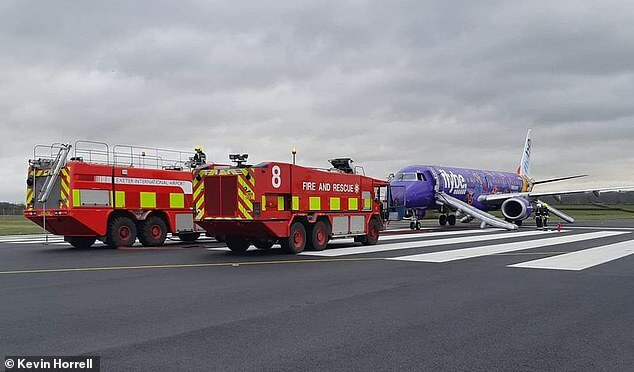 Kevin Horrell, from Caerphilly, South Wales, posted a picture on Facebook today of two fire engines next to a Flybe plane and wrote: ‘Well, this just escalated quickly. 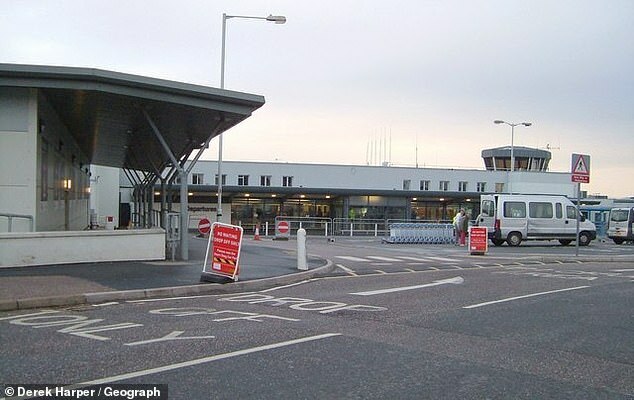 An Exeter Airport spokesman said no other flights were delayed, with a Flybe flight to Manchester experiencing unrelated technical difficulties. A Flybe spokesman said: ‘Flybe can confirm that the above flight scheduled to operate from Exeter to Alicante experienced haze in the cabin just prior to take off. ‘Flybe crew took the necessary precautionary measures and all 100 passengers and five crew members evacuated the aircraft safely. ‘We are taking the situation very seriously and our immediate concern is for the welfare of all those involved. The airline later added that it had secured a replacement aircraft which will take passengers from Exeter to Alicante at 12.35pm. Devon and Cornwall Police said its officers were not responding to the incident.